In a society where medical physicians make enough to buy big houses and live a comfortable life, take their kids on vacation and buy cars out of pocket, they should also be able to treat every patient to the best of their ability (as they promised under oath). For many of us, who spend hours in the emergency room it is not easy to take hours off our schedule to fix a health issue over the counter pills can't solve. Some of us have small children, jobs to attend, life. As a person who grew up with a doctor as a parent, I understand the stress and responsibility that being a doctor requires. I'm not a doctor myself, I have chosen to teach children instead but that also means I know being responsible for a life takes a lot of patience, dedication and passion. In 2014 I had a hormonal imbalance due to an anticonseptive (a patch my then physician recommended even tho I was less than 100 Lb). I started my period normal and I noticed it was lasting longer than usual. I though nothing of it because I knew that the anticonseptive could change the amount of days I'd see my period. After a few weeks with a regular flow I started to worry but I had to work because as a new immigrant responsible of her younger sister, I had to make money. Long story short at a tryout interview as a secretary in a law firm (ironic enough) I had been at that point been bleeding heavily for a week, so much I was using 6 to 10 large pads per day with lickages and in some cases blood running down my pants. I was weak and pale and the woman that kindly was trying to hire me noticed I was falling asleep in the job. 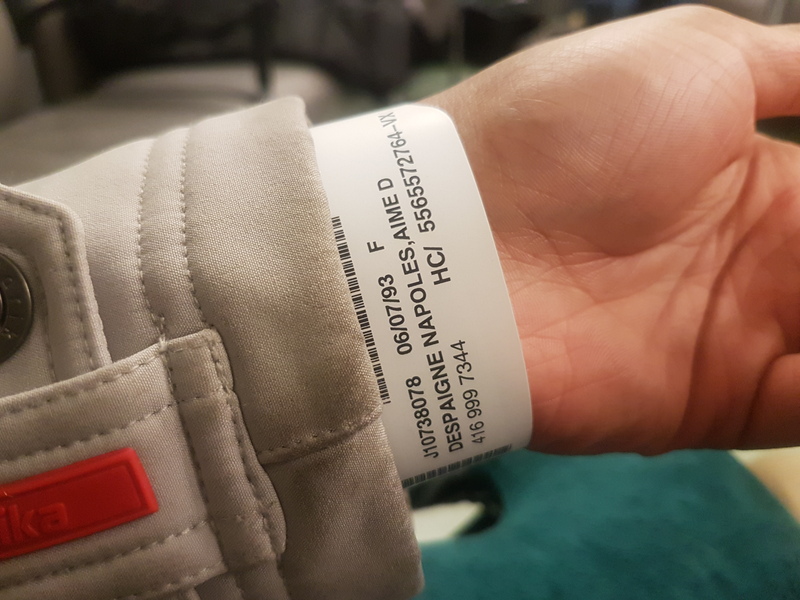 I told her I wasn't feeling well and after a few hours I called a friend to pick me up and take me to the nearest hospital (Humber River Hospital). At the hospital I talked to the lady in admissions and told her I was bleeding heavily and had been bleeding for a month. A Month! The lady asked me to sit and wait. While waiting my friend had to go and I was left alone waiting for about 2 or 3 hours in and out of consciousness. A nurse saw me standing because all sits were taken (also I didn't want to create a big bloody mess). She took me aside and made me lay in a stretcher. They take me in and a nurse takes blood samples and they tell me my hemoglobin is in 5 which is terrifying. They gave me 2 bags of blood in a period of 2 or 3 hours ( everything was a blur). I remember the pain when blood clots the size of an apple came down. A nurse would put it in an urinal and I remember she said "is going to be painful, it's like giving birth". I remember pushing with my legs open, sweating and in excruciating pain. After receiving blood a doctor came and said they needed the room and I could go home. I am no doctor but I was certain the doctor was making a mistake since my problem was hormonal and they had completely ignored that point. I told the doctor to admit me that I didn't want to go home while still bleeding. She said "we need the room". I took my things and left. Two days after I'm at a new job clining washrooms in a popular high end beach club. The good thing about the job was I could use the washroom to change my pad every 5 to 10 minutes. At this point I was bleeding so much by the time I got home I couldn't even walk. I remember bleeding through my pants as if someone had gutted me with a knife, and the pain unexplainable. I took a shower and went to bed. I remember waking up burning and sweating at the same time, barely able to breath, speak or lift my arms. To give you an idea of how weak I was I had to lift my phone and call my sister who was in the room beside me. I just said "come to my room" and hang up. I thought I was dying, and I was. I told her in a very low tone to call 911, that I needed to be taken to the hospital immediately. She repeated after me as the operator asked questions. I passed out. First responders came through and because my apartment building was so narrow they had do carry me. They took my blood pressure and looked at each other the way your friends look at each other when they have something tragic to tell you. They said they didn't know how I was still conscious. I passed out. I remember a little bit of the emergency room and I remember the hospital bed. Everything else before the second day is gone from my memory. I wake up in the morning and the doctor says they will take test to see if I had a miscarriage. I remember thinking I must have had bigger blood clots when she is asking me that question. They took me for an ultrasound which revealed the lining of my uterus was as they explain not retaining the blood in due to the patch I used. I was in the hospital for 2 days on medication to balance my hormones and stop the bleeding. I do not have good veins I have only one visible in each arm and so they poke those ones until they had to use my wrist veins. More pain. All the medication was intravenous and I remember telling myself this is not the worst part you've survived the worst. I get a fever at work and start feeling unwell. I go home and believe is just a flu (I took my flu shot and work with children with flu and colds all the time and I haven't catch the flu yet this year). Two days pass and I'm still having high fevers, sore throat, loss of appetite, vomiting, nausea, muscle pain, strong headaches. I Google my symptoms and I check my throat, I see white spots and I realize I have strep throat. At this point I live with my boyfriend who is a very busy musician. I tell him I need to see a doctor because if I had a strep throat it could get worse for me. We take an uber to St. Joseph's Health Centre. The usual hour or two wait to be seen by a nurse followed by another couple of hours to finally being seen by a doctor. The doctor asks me the usual questions and I tell him I have asthma. I notice he focuses more in the asthma than the infection and wait for him to do the physical exam, he even checked my throat. No test are taken even though I clearly have an infection and my glands are swollen. He tells me he will give me a salbutamol puffer (the blue puffer) and I tell him that's fine. I also ask him about any antibiotics for the infection and he says that an antibiotic will just give me more stomach ache and nausea. I followed his recommendations. I end up having to take four puffs every twenty minutes three times before going home. I go home and spend the night with high fever and vomiting. Is the morning and I have a migraine and my glands are so swollen to can clearly see them without saying ahhhh. That is not mentioning the big white spots I saw in the back of my throat. I asked my boyfriend to look and he said "oh you have mucus in your throat", I tell him no that's infection. I get so mad I get into this rant about suying the doctor or the hospital for misdiagnose. My boyfriend then says that legal fees are too expensive and that lawyers take most of the settlement. I tell him that I'm tired of bad doctors who don't care about patients, that almost everyone I know has had a malpractice or misdiagnose in Canada, that enough is enough. I then start writing this letter on my phone because I can't afford a laptop. In fact I am an ECE student at Humber College and have done all my school work on this phone. No big deal, I been through much worse. Maybe that's the problem, that the majority of us can't afford a lawyer, can't afford to stand up for our right to be treated by doctors with respect and obligation to give us the best health care. Maybe is time all medical boards in Canada reassess their practice and put not the doctors but the public first. How is it possible that with such high quality of life we live not wanting to go to the doctor because of the wait and because of the belittled symptoms. I do not care if many became a doctor just for the money you swore under oath to do everything in your power to give me the best medical treatment you could give me and you’ve failed. In a country where people die in emergency rooms after waiting for 11 hours like the case in New Brunswick. How many people have to die for the medical board to take action 10, 100? I might not be able to afford a lawyer but I can write a letter that rises awareness to those affected by the medical system. It doesn't work, enough is enough!